Although I wrote everything I know about squirrel issues for this website, oftentimes a problem with squirrels in the attic is beyond the scope of the do-it-yourself homeowner to solve. I have found a professional company in Kalamazoo, Michigan that handles problems with wildlife. 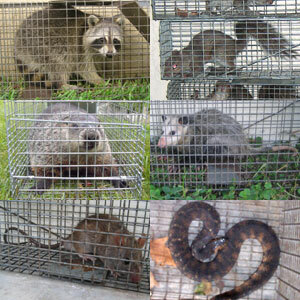 Advanced Wildlife & Pest Control has access to tools, techniques, and experience that help them do a far better job at wildlife removal than a non-experienced homeowner could. They possess licensing that allows them to do certain types of work legally, that non-licensed homeowners in the state of Michigan are not allowed to do. For the welfare of your situation, and the squirrels, in some cases it's best to hire a pro. There are good companies and bad companies out there. I've done research on such companies, to get to know them, and feel confident recommending their services. I therefore recommend a company called Advanced Wildlife & Pest Control which services Kalamazoo, Michigan. If you have a squirrel problem, or any other conflict with a wild animal, and live in Kalamazoo, I am confident that this company, Advanced Wildlife & Pest Control, is the one to call. I asked the company to describe their service range, and they said this - Our service range includes downtown Kalamazoo, Comstock, Portage, Texas Charter Township, Cooper Charter Township, west to Mattawan, east to Galesurg and even Battle Creek, and more. Advanced Wildlife & Pest Control operates 24/7, so don't hesitate to call at any time to discuss your wildlife problem, and schedule an appointment for same-day or next-day service. My response: Moth balls will not help at all. Have you checked to see if I know a professional squirrel trapper in your area here in Michigan? Hi David, I really appreciate you putting together all this squirrel info - great resource dude! So, few months back wife and I started hearing scratching in the wall near our kitchen bay window when we'd be watching tv at nite. We are thinking its squirrels and now its little more freq (maybe babies but not sure). I say freq because over time we are noticing it upstairs in the wall near our bed (of course wife freakin out - haha). So, I used to have numerous dbl door Havahart traps going up and catching birds and squirrels in the yard for fun. I have found an older 7" door trap that I will attempt to use soon. Sounds like maybe better to close one of the doors and just use one side, then put pnut butter and few nuts in back. I was going to try and place trap in the drop ceiling of the basement right near the kitchen bay window, but sounds like I may need to go in attic regardless. If there are babies then I know I will or find them ! ha I'm really trying to hold off having pros do it, because we were quoted like 1300 to remove them (whether one or more). Time will tell I guess cause I may need too. If you have a squirrel problem in Kalamazoo County Michigan, or any other conflict with a wild animal, I am confident that we can solve it. We use humane methods when dealing with Kalamazoo wildlife removal situations. Squirrel Control Kalamazoo. Our company is fully licensed and insured in Michigan. Call us any time at 269-679-6559 for a price quote and to schedule a same-day or next-day appointment to solve your squirrel problem in Kalamazoo.